Based on their play My Sister Eileen, which is itself based on the collection of short stories by Ruth McKenney of the same name. Eileen is a beautiful innocent from Ohio seeking fame as an actress on Broadway. Ruth is Eileen’s older sister, who wants to be a writer, but must protect Eileen from the unspeakable evils and dangers they’re sure they’ll find in New York City in 1935. In their basement apartment in Greenwich Village they fend off the former tenant’s “dance students”, are kept awake all night by underground dynamite blasts from the subway construction, hide their All-American football playing neighbor from his live-in girlfriend’s mother, both fall for the same guy, host a really uncomfortable dinner party, and teach a raucous group of Brazilian Naval Cadets how to conga, which leads to Eileen being hauled off to jail for creating a disturbance. And that’s just Act One! 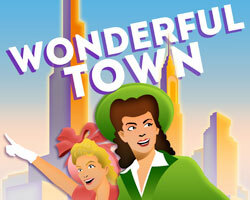 Wonderful Town won five 1953 Tony® Awards, including Best Musical and Best Actress. With a score that includes ”A Little Bit in Love”, “One Hundred Easy Ways (To Lose a Man)”, “Wrong Note Rag” and “Ohio”, why, oh why, oh why-oh? Why would you miss the first Leonard Bernstein show that MTG has ever presented?